If you were asked to name a cemetery in Gettysburg, you, along with most people, would likely say the Soldiers’ National Cemetery. However, Gettysburg has another cemetery with its own powerful story and unique history to tell—the Evergreen Cemetery. 1. The Evergreen Cemetery is not owned or operated by the National Park Service (NPS). Because of its close vicinity to the Soldiers’ National Cemetery, there is a common misconception that the Evergreen Cemetery is a historic site owned by the NPS. While it does have a rich history, the Evergreen Cemetery is privately owned and operated. 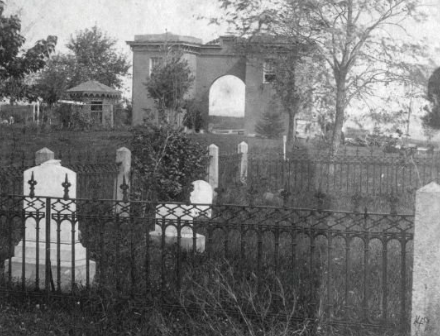 The cemetery was established in 1854 after a year of deliberation. David McConaughy, a noted attorney in Gettysburg, is credited as its founder and worked with a committee of about 21 prominent Gettysburg citizens to establish the cemetery. This committee held regular meetings and facilitated subscription sales, prepared the charter and constitution, and created regulations for the cemetery. McConaughy was later named president of the cemetery’s board of trustees. In late 1855 the cemetery gatehouse was built, and the first superintendent, Peter Thorn, was named and lived there with his wife Elizabeth. The name Evergreen was created during the Victorian rural cemetery movement where large, beautifully landscaped properties were developed to provide inspirational “green space” in cities. Town cemeteries were more than just burial grounds—they were a place to talk to the deceased, honor them with flowers, and even have a family picnic. 2. The Evergreen Cemetery saw live battle action. Civilians living in Gettysburg during the time of the battle soon realized that no ground was safe from the ravages of the war—not even the final resting place of their loved ones. 3. The burial of the battle’s dead fell largely on the shoulders of a pregnant woman. Elizabeth Thorn found herself with the daunting task of burying Gettysburg’s dead while six months pregnant. With her husband off to war, she took on the role of superintendent and mother and buried nearly 100 Union soldiers’ remains in Evergreen. When the Soldiers’ National Cemetery was ready, 50 bodies buried by Elizabeth were exhumed and reinterred into their new plots. The families of the remaining buried in Evergreen did not wish for their soldiers to be moved. Today, there is a statue of a pregnant Elizabeth, which serves as a memorial to her and all women who offered service and support during the battle and its aftermath. 4. The Gettysburg Address was delivered in Evergreen Cemetery. President Abraham Lincoln came to Gettysburg in November 1863 to dedicate the Soldiers’ National Cemetery. His remarks at this dedication are now famously known as the Gettysburg Address. Because he was in town for the Soldiers’ National Cemetery ceremony, many assume that the speech was also delivered there. However, the platform where Lincoln delivered the speech was actually located in Evergreen Cemetery. 5. Evergreen Cemetery is still active today. Evergreen Cemetery is still a fully functioning cemetery with open lots available for burial. The Cemetery honors its history by providing walking tours of the property. Individuals can visit the women’s memorial and the gravesites of several notable people, including several Civil War soldiers, the Thorns, David McConaughy, Rev. Samuel S. Schmucker (the founder of Gettysburg College and Gettysburg Lutheran Theological Seminary), and American poet Marianne Moore. Gettysburg National Military Park, Eisenhower National Historic Site, and Soldiers’ National Cemetery are Gettysburg’s historic crown jewels. But the hidden gems, like Evergreen Cemetery, make Gettysburg unique and remind us of the widespread havoc the battle left on this small town.